While if you were to mention the word “tifo” to a typical side liner Fire fan, you’re still likely to get blank stares or questions about your DVR, there has been a building awareness in the stadium that on important match days, there’s usually something big going on before kickoff in the Harlem End. Home Openers, league matches with rivals, playoffs, cup finals — they’re all occasions to break out the good stuff and show the players on the field that the entire stadium stands behind them, to a one. And there is a tradition of this in Fire support — this is no new phenomenon that arrived with the construction of our home at 71/Harlem. As far back as 1998 there have been efforts by fan groups to create organized visual displays of support – or “tifo” – to create that extra oomph for both players and fans that makes our home stadium a fortress. This tradition, specifically that of “choreo” – the brand organized and done before kickoff in an important match – has its roots in continental European soccer. Supporters’ groups for prominent clubs like AC Milan and PSG are known to have the volunteer support of well-known artists to plan and execute elaborate displays. And while the Italians, Spaniards, and French popularized the actions, any look at a big game from Poland, Sweden, Germany — and now Japan, Australia, and Argentina — will see similar coordinated efforts by the fans, often without the assistance or input of the actual professional club. These actions require the dedication of time and funds from the fans themselves — making them completely unlike anything in other sports and acting as another way those fans have stock in their club. 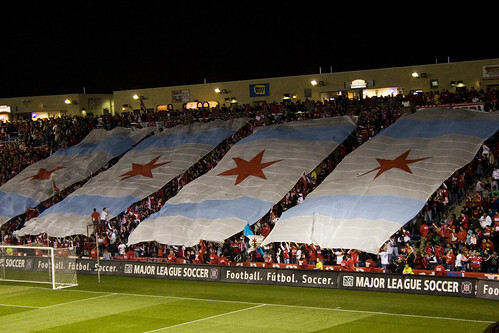 As the season progresses through the summer months, and the urgency and significance of our home matches builds, let’s take a look at some Chicago tifo through the last ten years. 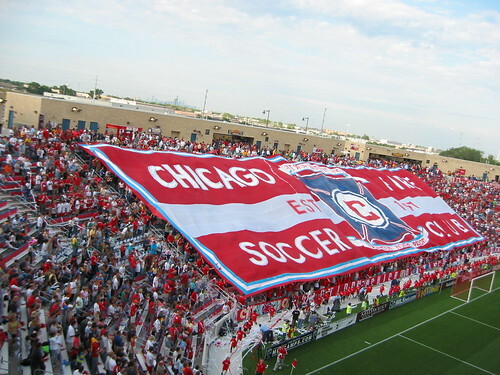 One of the first organized visual efforts by the Barn Burners supporters group, a large Chicago municipal flag was acquired (roughly 30ft across) and used continuously from 1999 to 2003. Over time it became famous for its ‘battle scars’ – or melt holes from smoke canisters and flares used nearby. Toward the end of its use it even had a orange tint all across its bottom from the use of a wrong-color smoke canister. 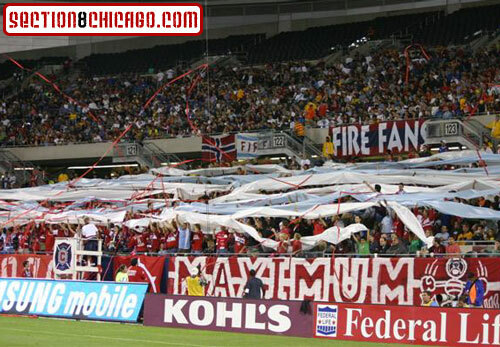 Several attempts were made at organized choreo during the Fire’s brief exile in Naperville, but the exuberance at returning to the city and New Soldier Field came out in the success of this action for the first match played there in late 2003 vs Columbus. 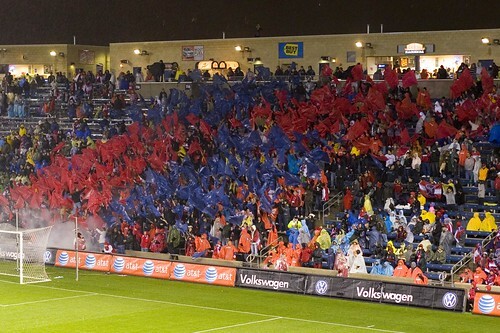 The use of colored plastic rolls to cover the two seating areas of Section 8 resulted in one of the most enduring images for the Fire as the club steamrolled Columbus 2-0. Framed photos of the choreo could be seen in the club offices for many years after. With the sudden firing of club president Peter Wilt by then-owners AEG prior to the 2005 home opener, a protest action was quickly organized and executed for that match. The sections were cleared out for the first eight minutes of that game against SJ Earthquakes, save for a large black banner with the simple question “WHY?”. All the banners in front of the section were similarly covered with black plastic. After those eight minutes, the sections were filled, with everyone wearing black, and at the start of the second half raised black plastic rolls above their heads in a show of unity. When the Fire played host to Italian club AC Milan, whose fans are among the best-known world-wide for their advanced use of choreo (see this as example), Chicago fans decided to make their best efforts at doing an action of a high standard. The result, an enormous painted city Skyline, backing stripes of green (for the lakefront parks) and blue (for Lake Michigan) is to this day a great example of what can be done when our supporter groups coordinate and cooperate for a common goal. Although also done during the second half of the AC Milan match, a flag choreo was executed before the doubleheader with Real Madrid that same summer. Alternating horizontal bands of white/light blue/white/light blue/white exploded from the seam in the middle of section 8 as four red star bursts of streamers shot out from the center band. The grand opening of the new stadium at 71/Harlem in 2006 gave a considerable lead time to plan the action for that first full-scale match there. With the ability to plan further out, a goal was set of achieving something unlike ever attempted in this country, and in doing so set the bar for support in the new stadium at a high level right from the start. With the help of Fire fans in Poland, a roughly 80yd x 25yd banner was constructed, covering the entire Harlem End of the stadium with the words “CHICAGO FIRE SOCCER CLUB” and the club badge displayed across its breadth. As it was unfurled, red and white cards were raised by fans throughout the stadium not covered by the flag when the players stepped out of the tunnel for that first time, after raining down red streamers from every last seat inside. Needless to say, we beat NY 2-0 that day and established the standard for what it means to play for Chicago in our new home. While still visually strong, the stormy weather and traffic conspired to make the display less effective then envisioned. Bands of color to each side of S8 were intended to frame a large red field with a white Fire “C” in the c enter; created through the holding up of two-pole banners by everyone in the section. To ‘get back on the horse’, so to speak after a disappointing result for the Home Opener, around 1000 small red/white checkered flags were purchased and distributed throughout S8 for a summer evening match. No good photos of this choreo exist, however, due to the revocation of official photo credentials for this match by a former Fire employee. The tenth anniversary match in October 2007, against New England, had both the rivalry and the significance of the event going for it; necessitating an adventurous display. Both horizontal and vertical colored rolls were used throughout the end, with a large banner at the rear commemorating the life of the team from its inception in 1997. 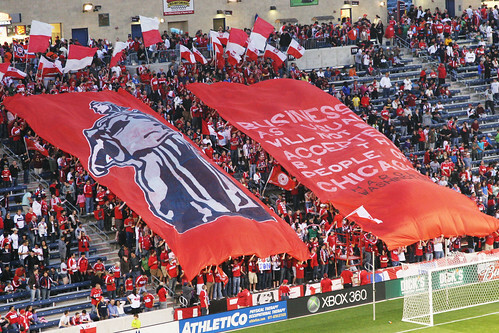 For the home match against DC United in the spring, involved the creation of 30 enormous red/white/red temporary flags and the waving of red (in 117) or white (in 118) balloons overhead, and the release of streamers at kickoff. Though somewhat dampened by weather (the original front banners got claimed by mold and were replaced at the last minute by one from last season) and uncooperative staff, the choreo was mostly successful and a reinvigoration of a drive to do things even bigger and more successfully. Flags have long been a key part of Fire support, and for the home opener we purchased a couple of hundred Fire flags and attached them to four foot PVC poles for a simple pre-game display. For the crucial final game against Chivas USA, we constructed several hundred navy and red flags arranged in a classic checkerboard fashion for display early in the game. 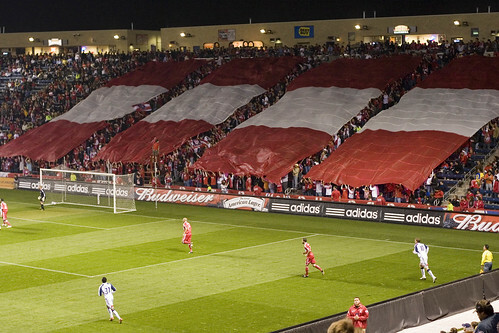 At short notice, two days labor was put into creating a massive red and white banner covering sections 116-119 made out of table rolls taped together to echo the Fire’s traditional home jersey design. The initial design included “FIRE” written across the white stripe, but the timing issue leaves this for realization in a future project. For the Eastern Conference Final, this display involved the creation of an enormous overhead banner covering four sections making up the Chicago flag, constructed of dozens of table rolls painstakingly taped together. 1,000 streamers and 40lbs of confetti were also released simultaneously from the terrace. Two reusable banners covering the entirety of 117/118 were produced for the home opener, with the Harold Washington quote “Business as usual will not be acceptable by the people of Chicago” featured. Following a tifo design contest, a stadium-wide display featuring umbrellas raised after the national anthem in section 101 (Sector Latino), the Skyway, the Harlem End and around the club seats was executed. Special permission was granted by stadium authorities for the use of umbrellas, the first time they have been included in an MLS tifo display. For a game against Xbox-sponsored rave green Seattle Sounders, Section 8 Chicago created an animated tifo display featuring characters from the Mario Nintendo game. 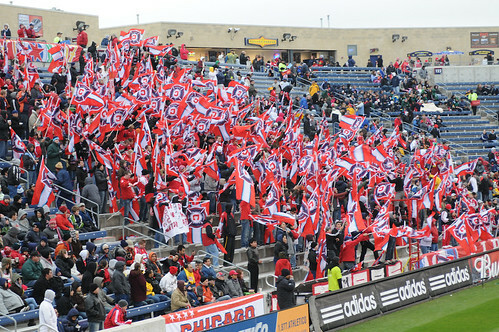 For the 2012 home opener, Fire fans made extensive use of space provided by new partners Chitown Futbol to construct and paint a 40-foot diameter cf97 logo, which was paired with large banners and red & white squares urging a return to success after two seasons’ worth of unfulfilled dreams. The unfurling of the second Megabandera occurred six years after the first against the same opponent. With all of the talk and hype around the league of New York as a premier destination for the big stars, the second coming of the Megabandera proved Chicago is the destination for fans with big plans. 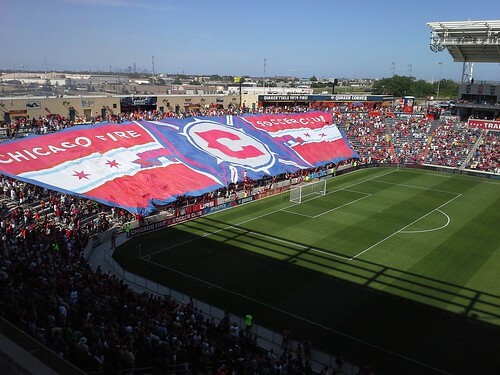 Coming off a 2012 season with the best home record in Toyota Park history and one of the best regular season records in club history, this tifo was displayed in anticipation of the thrilling new season to come. Like the phoenix rising with the sun, the Fire are expected to rise to the top of the league. This is the largest hand made tifo to date as Fire fans spent a large number of dollars and hours on this magnificent work to represent the belief that all Fire fans hold together: Chicago will RISE above them all. These days, choreo is often organized by an individual supporters’ group in the section, prepared and funded by its members (for example, the 2008 DC tifo was organized by Ultras Red-Side) but often requires donations of time and money section-wide; particularly for enormous projects like the megabandera. If you appreciate the importance of generating the home atmosphere at Toyota Park, and enjoy the coordinated displays, consider assisting in any manner you feel comfortable with — donation of money is much appreciated, as that of the time and space needed for construction. Contact the ISA Board for more information.